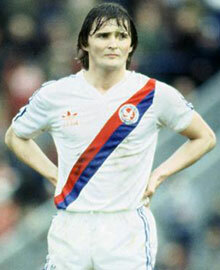 Crystal Palace only escaped a second successive relegation on the penultimate game of the 1981/82 campaign. Top scorer Clive Allen was sold to QPR in the summer with Palace getting Hoops centre-back Stephen Wicks as part of the deal worth £675,000, while Stephen Hughes arrived from Gillingham. Back down to football's second tier, Dario Gradi's Palace got off to a winning start with a 2-1 victory over Cambridge in the month's only fixture. All three goals were scored from the penalty spot - Paul Hinshlewood netted the first after Palace were handed a penalty with just 55 seconds gone and he scored another later in the half. South African centre-half Gavin Nebbling was signed from Arcadia Shepherds. There were wins over London rivals Charlton and Leyton Orient but Palace slumped to defeats against Norwich, Sheffield Wednesday, Venables' QPR on the plastic pitch and Shrewsbury. Paul Baxter joined from Tottenham. It was an indifferent month for the Eagles with back-to-back wins against Rotherham and Wrexham - the victory against Wrexham was Palace's first away win for 19 months -two defeats (Derby and Luton) and a draw at Leicester. Palace lost their first leg Milk Cup tie with Doncaster 1-0, but beat them 2-0 at Selhurst Park to progress 2-1 on aggregate. They ended the month 14th in the Second Division. On the transfer front, Kevin Mabbutt (brother of Gary) joined from Bristol City for £200,000, Steve Galliers signed from Wimbledon and Terry Boyle came in from Bristol City. Midtable Palace were victorious against Norwich and Bolton, lost to Blackburn and played out a stalemate with Oldham. The Eagles saw off Sunderland in the Milk Cup. Gradi was sacked after less than 10 months at the helm and replaced by Steve Kember who was promoted from youth coach. The Milk Cup run ended at home to West Brom and Palace lost in the league at Barnsley to end 1981 in 13th position. There was better luck in the FA Cup as Palace knocked out Enfield and Bolton. In the league, there were goalless draws with Cambridge and QPR plus a defeat at Sheffield Wednesday as Palace slipped down the table to 15th. Kember snapped up Paul Wilkins from Tottenham. Steve Kember's side beat Leyton Orient away in an FA Cup replay after the first match at Selhurst Park ended goalless. There were losses against Charlton and Rotherham and a draw with Orient in the league. Leslie Carter left for Bristol City and Ian Walsh departed for Swansea. In a packed month of fixtures, QPR ended Palace's FA Cup dreams with a 1-0 win at Loftus Road in the quarter-finals - the best run since reaching the semi-finals in 1976. Former striker Allen scored the late winner. In the league, Palace lost to Derby, Leicester and Blackburn, drew with Luton, and Newcastle and triumphed over Cardiff and Chelsea. Palace were three places and three points above the relegation zone in 17th spot. Winger David Giles arrived at Selhurst Park from Swansea. Steve Wicks made a swift return back to QPR and Billy Hughes was transferred to Wimbledon. April saw another month packed with fixtures that had Palace win against Oldham and Grimsby, draw with Watford and Bolton and suffered defeat against Grimsby, Chelsea and Watford. The Eagles moved up a couple of places but were still three points away from the trap door in 15th. Palace lost their opening two matches of the month to Barnsley and Shrewsbury which gave them just a one point buffer above the relegation area. But wins over Cardiff and Wrexham ensured survival even though Palace lost at home to Newcastle on the final day after the Magpies scored two goals in the last two minutes. Palace finished in 15th place but the 34 goals scored was the lowest in the division. Kember was sacked at the end of the season.